Bangkok is fast becoming the world’s hottest city and this new three-day itinerary allows guests to explore the best of the pulsating Thai capital. View the city from the luxury of a rooftop bar, before descending on to the bustling streets to explore temples filled with emerald and gold Buddhas, mouth watering food stalls and sprawling modern shopping malls. The surreal cityscape view and local commuters will leave you with a lasting impression of true Thai life. Walk through the ancient ruins of the former Thai capital of Ayutthaya – where you’ll be whisked back in time. Welcome to Bangkok! Your driver and guide will welcome you at the airport and take you to the hotel for check in. Free time and relax. This morning, leave Bangkok for Ayutthaya – 70km from Bangkok. The first stop is the Bang Pa-In Summer Palace Palace also known as Summer palace located 18km from Ayutthaya on the bank of Chao Phraya River. Arrive in Ayutthaya – the ancient capital for over 400 years. 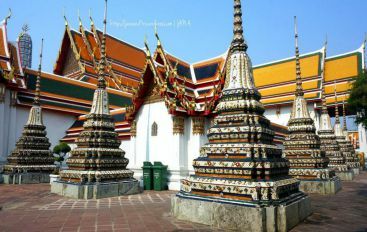 You will visit Wat Maha That – an over 600 years old temple and Wat Na Phra Mane. Wat Na Phra Mane is still in good condition and was used as the Burmese military headquarters during the war. Inside this temple, you will see the sparkle Golden Buddha with the three thousand-year-old Buddhas carved from green stone which are extremely valuable national relics. Back to Bangkok. Free until time transferred to the airport for your departure flight home. Have a good journey back home. Thoroughly enjoyed this tour. Our tour guide provided great explanation of the various sites and history making it all the better. I thought time was allocated well to the various sites and the size of the group was not too small or too large. Definitely a must do! This UNESCO heritage site is not to be missed. If you are staying in Bangkok, this is a bit out of the city, but so worth the time to see it. Old ancient temples truly give you a great feel for Thailand and its history, people, religion, and culture. Buddha in a tree, reclining buddha, and lots more. This UNESCO heritage site is not to be missed. If you are staying in Bangkok, this is a bit out of the city, but so worth the time to see it. Old ancient temples and lots of buddhas without heads, truly gives you a great feel for Thailand and its history, people, religion, and culture. Better as expected The ride was very easy and the boat ride home was surprising in the food was really good. I don't usually experience good food on tours! Our tour guide was very friendly and had a lot of knowledge to share. The food was amazing however there was too much for only two of us to eat. It would have been nice to have smaller portions. The temples where beautiful in this area.